ATLANTA, GA--(Marketwired - October 08, 2015) - On September 19, 2015, DeKalb Business Today welcomed to the studio several members of the East Metro DeKalb Community Improvement District (CID). 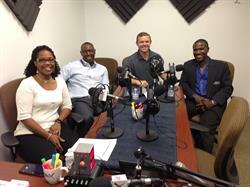 Host Matt Holmes sat down with local business owners Nicole McGhee Hall, Van Jakes and Lloyd Nurse to discuss ways that they -- and their businesses -- are helping to make East DeKalb a hot spot for innovation and investment. The East Metro DeKalb CID was formed in May of 2014 and is located in the south eastern portion of DeKalb County. The East Metro DeKalb CID serves as an economic development tool to implement major improvements including infrastructure, public safety and beautification enhancements in an effort to increase property values, revive business and enhance the overall quality of life of the area. Nicole McGhee Hall serves as the CID Administrator and is the founder of Nickel Works Consulting. For the past 20 years, Hall has been primarily focused in the area of transportation. She has worked with multiple CIDs in the Metro Atlanta area, providing Administration, Expansion, and Formation Services. She is a 2014 Atlanta Regional Leadership Institute graduate and a Georgia Academy for Economic Development graduate. Hall’s team works for businesses, in communities and with the governments. Also in the studio was Van Jakes, CID Board Member and owner of Jake 22 Management Company. Under the umbrella of his management company, Jakes is a McDonald's Franchisee, operating three restaurants in the Stone Mountain/Lithonia area of DeKalb County. In addition to being retired from the NFL, Jakes has many affiliations, hobbies and philanthropic interests. Rounding out the discussion was Lloyd Nurse, co-founder and CEO of Nurse Technologies, a company geared towards raising awareness of problems related to medicine usage. Nurse Technologies' goal is to use technology to improve accountability regarding medicine distribution and management and to create solutions that are simple for medicine users. They also provide real-time information for healthcare professionals. To learn more about the East Metro DeKalb CID and these featured guests, listen to the entire interview on DeKalb Business Radio. Broadcasting live from beautiful downtown Decatur, DeKalb Business RadioX is the voice of business news in DeKalb County. Each week on DeKalb Business Today, hosts Matt Holmes and Jason Becknell interview top business leaders and entrepreneurs to help them get the word out about their businesses and help them connect with other industry leaders. DeKalb Business Today airs on Fridays at 10am Eastern. Business RadioX® interviews dozens of innovative entrepreneurs and successful leaders each week. Its mission is to help local businesses Get the Word Out about the important work they're doing for their market, their community, and their profession. With a pro-business slant and a long-form interview format, guests don't have to worry about being ambushed or talking in "sound bites." Guests have enough time to tell their whole story and to share their insights and experience without interruptions. Business RadioX® hosts are business professionals interviewing their peers, drilling down on the critical issues, and delivering practical information to an engaged business audience. Business topics that are frequently covered include: Law, Finance, Healthcare, Technology, Trade Shows, B2B Marketing, Venture Capital, Training and Development and other issues impacting the business community. For more information, visit: http://businessradiox.com.